LOS ANGELES — The passes looked so crisp when D’Angelo Russell found teammates that his defenders did not notice were open. The shots looked so smooth as Russell squared up from the both behind the perimeter and in the post. The defensive activity looked sharp as Russell contested shots and pointed out rotations. In a season in which the Lakers hoped their second-year guard would blended all those ingredients together consistently, Russell mixed the right recipe to ensure nearly a complete game in the Lakers’ 119-108 loss to the Washington Wizards on Tuesday at Staples Center. Russell has taken his game to another level recently. After struggling with a short-lived bench role so Walton could evaluate Clarkson at point guard with traditional lineups, Russell has lived up to the message the Lakers’ front office and coaching staff preached about staying aggressive. In the past five games, Russell has averaged 24.6 points while shooting 48.8 percent from the field and 42.5 percent from 3-point range while tallying 5.6 assists. He logged a career-high 40-point game on March 19 against Cleveland where he showed more efficiency with his shot (14-of-22 from the field; 7-of-12 from 3-point range), his passing (six assists) and his ball handling (one turnover). And with Russell’s shot going in, Walton saw that positively affect the rest of his game. Russell showed that in various ways. He looked for Lakers rookie center Ivica Zubac early for open floaters and layups. Russell made quick passes to Clarkson when he cut along the baseline or toward the basket, resulting in both open jumpers and an open lob. When Walton found his players “waling around too much offensively, Walton offered Russell with some simple instructions. “We need to push the pace faster,” Walton said. So, Russell pleaded for the ball nearly anytime the Lakers made a defensive stop or he found the Wizards laboring on defense following a missed or made shot. After Lakers forward Larry Nance Jr. grabbed a rebound on two late first-quarter possessions, Russell sprinted to set himself up for an open jump shot and 3-pointer, respectively. After Russell rebounded the ball on the last possession of the first quarter, he set up David Nwaba for a fast-break layup before the buzzer sounded. When Lakers forward Julius Randle cleaned the glass on a third-quarter possession, Russell ran again to set himself up for an open jumper. In other words, more work awaits. The Lakers would also like more in their overall consistency. After all, the Lakers (21-53) lost for the eighth time in their last nine games. The Lakers allowed Washington (46-28) clinched a division title (Southeast) for the first time in 38 years and swept the regular-season series for the sixth time in Lakers’ franchise history by prevailing in crunch time. After opening the fourth quarter on a 9-0 run, THe the Lakers went more than three minutes without scoring. Russell’s consistently also waned. He went 1-o-f7 in the final period. 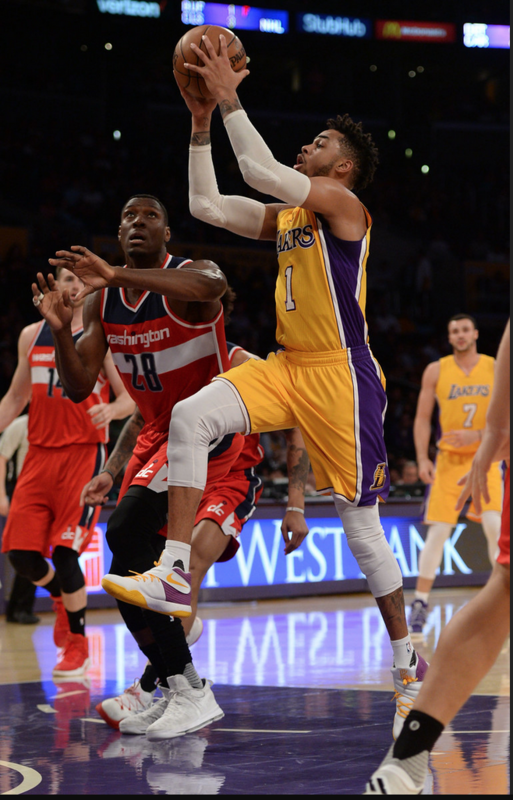 Russell made a costly turnover that led to a John Wall dunk to tie the score at 101-101 with 5:41 left. After missing his next two shots, Russell then made a basket and a pair of foul shots. Wall (14 for 25 from the field) later made a 3-pointer over Russell for a 117-108 lead with 56.9 seconds left. Yet, Walton said he did not care about those misses since Russell still played with the same mindset. Though Russell played the entire fourth quarter, Walton also cited his substitution patterns in the fourth quarter in which Randle and Clarkson did not enter the lineup until nearly the halfway point. All of which apparently came down to a simple development.